The hospital is located in the eastern corner of Komárom-Esztergom County, 46 km far from Budapest. It is more than 100 years old, configured in pavilion system, is an institution for patients' health care supply. Even in the heart of city Esztergom the inner athmosphere favours for healing of patients, owing to a green area of several hectars. From 1st of January 2011 on, the total number of beds is 483, including 378 active ones. Three beds are temporarily out of function, namely those of the emergency department. There are 105 beds with chronic profile, including 41 for rehabilitation of locomotor system's diseases, 39 for chronic psychiatry and 10 for hospice care of cancer patients. 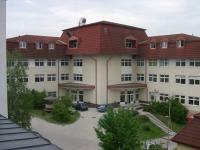 From 1st of August 2011 on, 15 beds formerly used for oncological rehabilitation are temporarily out of function. Currently, the number of inhabitants belonging to the area of patients' attandance is 97.000, as regards the different branches of internal medicine (i.e. cardiology, gastroenterology, nephrology, hematology and oncology), such as surgery/vascular surgery, obstetrics/gynecology, pediatrics and intensive care. As regards other disciplines, namely neurology, oto-rhino-laryngology, ophtalmology, urology and psychiatry, the area of patients' attendance is extended for 138.000 inhabitants. Moreover, rheumatology covers the whole population of the county (318.000 inhabitants), since the sole rheumatologic in-patient department of the county is found in Esztergom. Attandence of out-patients and in-patients takes place in the frame of an integration system in all disciplines. Almost all are represented within the hospital, wich functions in a pavilion-system. Currently its proprietary is the city itself. The last reconstruction was performed in 1998. In 2000 there were 450.000 patients accepted as out-patients, which means a 10% increase, in comparison with the average of the former years. The first matrix-department in Hungary has been established in our hospital, due to the mergence of ophtalmology and oto-rhino-laryngology departments. Our institute obtained repeatedly the title "Babies' Friend Hospital" in 2009. In 2009, the National Institute for Childrens' Health Care (as a sponsor) invited a tender for obtaining the title "Babies' Friend Hospital" (Bababarát kórház). Among others also our institute submitted an application, and it was found successful by the sponsor. Owing to the favourable judgement, the sponsor has assigned a fee of 2 million HUF for our institute, as an appropriate health care institute with obstetrics and newborn department, thus promoting a permanent adherence to the prescriptions of WHO/UNICEF, since this adherence is a prerequisite for prolonging the right to preserve this title as well. The contract of support was signed in March 2010. The right to preserve the title "Babies' friend hospital" is permitted for three years at maximum. Esztergom is known as the town of our first king, Stephan the first (named although Saint Stephan (Szent István)) the founder of the Hungarian Christian state around 1000 AC, i.e. 1000 years ago. The history of health care in Esztergom dates back to the reign of Saint Stephan (997-1038 AC). The first lazarette (i.e. 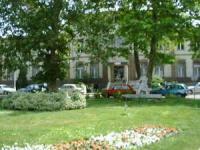 hospital for leprosy) in Hungary was established here at that time. The eponym of the present hospital is prince-primate Kolos Vaszary. He has offered the largest donation for buililding a new hospital. By the end of nineteenth century, the former hospital, originally founded as an alms house (asylum pauperum), was not more sufficient to perform the health care supply. Its leader was Sándor Fechtinger, a botanist with European reputation and director of a school and a bank in the same time. Following the examplary of the prince-primate, many other persons offered donations for building the new hospital. Their names are visible at the marble tablet of the old surgery department. The building operation itself started on the 10th July 1900, the first patients were admitted on the 12th December 1901. There were 8 buildings of different size, with 104 premises, the health care staff consisted of two doctors and 5 nons. The first director was Béla Gönczy MD. We can find an epithet on his grave in the downtown cemetery (Belvárosi Temető): "creator of the hospital". The hospital (named Kolos Hospital until 1948) was directed by him and his godson Béla Égenhoffer MD. The duty of caring patients was fulfilled by merciful sisters (belonging to Saint Vincent of Páli order) until 1950. Our hospital, being the public hospital of city Esztergom was very susceptible to all political discriminations afflicting the "clerical" city itself. It was as late as 1989 when our institute could assume the name Vaszary Kolos Hospital, Esztergom. In spite of many difficulties, the hospital could survive the last 110 years, owing to several renewal attempts from time to time. There is a large series of famous physicians who started his/her carrier in our hospital, or worked for shorter or longer time here, among others Attila Naszladi, Mariann Boga, János Holló, Péter Votisky. Furthermore, professors István Pénzes, Vilmos Csernohorszky, Lóránt Lél-Őssy and Árpád Szállási were our colleagues as well. The complete list of outstanding personalities would be much longer. Likewise earlier, even nowadays it is a privilege to be the priest of Hippocrates in the city of Saint Stephan, and hopefully, it will remain so in the future as well. Although the current Hungarian health care problems afflict our hospital, perhaps more than the majority of Hungarian hospitals, we are facing onto the future with an optimistic feature, owing to our past. We are hoping that the city of kings located in the heart of Euroregion Ister-Granum will regain its former historic role in the context of health care as well. You can read detailed informations on our website about the services offered by our individual departments, which are accessible for the inhabitants of not only Esztergom, but even of the county, and in some respects of the whole country needing health care supply. Kolos Vaszary was born on the 12th February 1832 in Keszthely, Hungary. His father was a poor furrier, later on the family made the home in the village Vaszar, Veszprém county, and the name of the family has been changed accordingly. His mother, namely Teréz Bajnok was born in the village Kéthely, Somogy county. Having passed the elementary school, he continued his studies in the high school of Premontre convent in Keszthely. He was admitted in Benedictine Order on 15th September 1847. He was ordained on 26th May 1855. He said his first mass on the 3rd June 1855 in Komárom, Hungary. Then he was delegated to Pápa (Győr County) where he spent 6 years as teacher, then he was translated to Esztergom in 1861, where he continued his carreer as a teacher of world history, Hungarian history and Hungarian literature. He was an active member of the social life in Esztergom at that time too. He was the co-worker of the newspaper "Esztergomi Újság" (Esztergom News) from its foundation (1862) on. As a teacher in Esztergom, he passed university examinations of geography and history on the 31st March 1867, although only the newly engaged teachers were obliged to pass exams. Consequently, he became the first chartened high school teacher of Benedictine order. He prepared lots of issues in order to promote the study of his pupils. His two comprehensive works, namely World History ("Világtörténelem") and History of Hungary ("Magyarország története") were issued in 1863 and 1865 respectively. The Consociation of Saint Stephan (Szent István Társulat) issued an edited form of his lectures having been held in the subject, the Battle of Varna (In 1444 the united Christian armies under the leadership of the Hungarian commandant, János Hunyadi sustained a serious defeat from the the Osman Turkish Army near to Varna). Kolos Vaszary, the future prince-primate stayed in Esztergom as a teacher until the year 1869, when he was appointed by the prelate of Pannonhalma (Hungarian center of Benedictine Order) as director of the Benedictine High School in Győr. From 1879 on he was the member of the directing council of the State Training School Institution (Állami Tanítóképző Intézet), then he had an active role in the city council of Győr. Following the death of Kreusz Krizosztom, prelate of Pannonhalma on 11th January 1885, the Benedictine Order appointed three candidates as potential successors, all of them were introduced to the King. The letter submitted by the chapter of the order contained the followings: "Kolos Vaszary is especially outstanding as an epistoler, a teacher and monk. He exerts the obedience with a paternal heart, his thoroughful knowledge is transmitted with an encouraging rethorics. As regards the practical aspects, he testifies a wise strentgh in judgement accopanied with with the love of justice. The love of his consociates was appreciated by him as a valued treasure." On the 28th of April 1885 Kolos Vaszary advocated as first choice applicant was appointed by the King as prelate of Pannonhalma. The order was directed, supported and led by him 6 years long from the Hill of Saint Martin (the hill of Pannonhalma Abbey). The high efficacy of these activities was acknowledged by the adjudication of the Grand Cross of the Order Francis Joseph (Ferenc József rend nagykeresztje) in June 1891. The idea of his appointment as the successor of the former prince- primate, János Simor first appeared at that time. The document of his appointment was signed by the King in October 1891. The inhabitants of the Catholic capital were convinced of accepting him with a great ceremony, however, the newly appointed primate arrived to Esztergom in a silent, almost unnoticeable manner. Even the consacration as bishop held in the primate's chapel (prímási kápolna) on 7th February was performed without any major ceremony. The establishment of kindergartners' training school, (16000 crowns), the building of main high school (10.000 crowns). In the occasion of his inaugural he offered 5000 crowns for the civil unions of Esztergom, and 7000 for the statue of holy trinity. He supported the training school with a sum of 22400 crowns every year,which was spent for the sallary of teachers, and for financial support of 12 students. The maintenance of kindergartners' training school was ensured by an allocation of 10.000 crowns on a yearly basis. This sum was spent for the sallary of teachers and the financial support of 30 students. The institute for women' education in Viziváros (Water quartier) was supplied by him with 4000, the Franciscans of Esztergom with 600 crowns on a yearly basis. Last but not least, in addition to the costs of the hospital foundation, he overtook the interest burden of the building process itself until a yearly sum of 2000 crowns. He established a fund of 10.000 crowns for the charity school and the alms-house of the Catholic teachers. Further funds were allocated for the paupers of his birthplace, Keszthely (100.000 crowns), such as for the students of the main high school with a sum of 50.000 crowns. He has wrote about his role as a primate: "I do not find any other positive properties concerning my person, except the recognition: you can do many good works for others." As regards the fights in the field of church politics, he was the leader of the conservative opposition. From 1894 on, he was a presidential member of the Hungarian Academy of Sciences. He disclaimed the Danube pontage of Esztergom, such enabling the building of a new iron bridge. On th 28th September 1895 he consacred the new bridge, named Mária Valéria. On the 3rd May 1896, in the occasion of millenium feasts, he told a praise addressed to the king, the queen and the nation, and he was awarded with royal recognition. On the 31th of December 1912 he disclaimed the majesty of prince-primate of Esztergom; he resigned to his vacation house in Balatonfüred, and he paid attention primarily to his historical studies and monographs. He died on 6th September 1915. He was buried in his birthplace, Keszthely, according to his testimony. His ashes have found their eternal couched in the crypt of the Esztergom Cathedral, due to the ordainment of primate László Lékai in 1981. Now we cite the proposition of chief prosecutor, István Földváry spread on the records on the session of the general assembly Esztergom (Közgyűlések) No 88/1899 held on 5th June. "Regarding the palatial donation offered by his Eminence for the foundation and building of the hospital, and his recent self-abnegation for eliminating the last obstacle of the fulfilment, the city council has decided to denominate the new hospital to be built as Kolos Hospital (Kolos kórház) as an obeisance before the prenomen of his Eminency. The citizens of Esztergom used this name among each others, even when its official name was: Városi Tanács Kórháza (Hospital of City Council). "These walls should stand for the benediction of the suffering mankind".